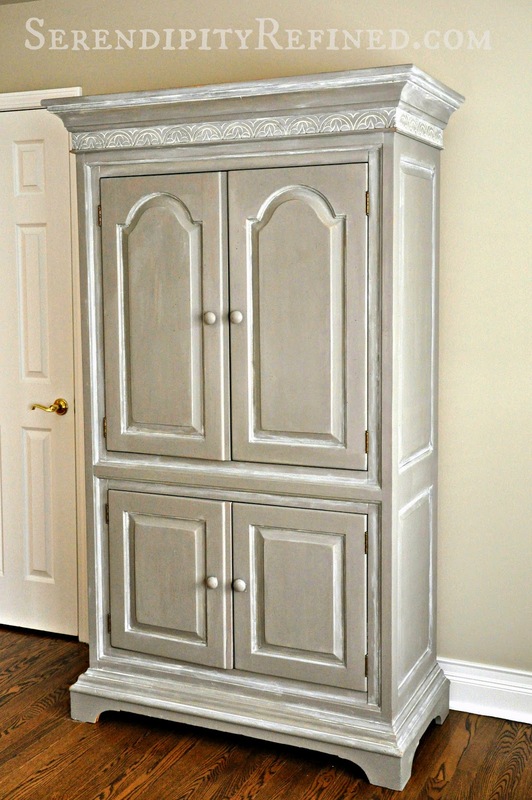 The second reader painted furniture piece in this year's series is Maureen's armoire. 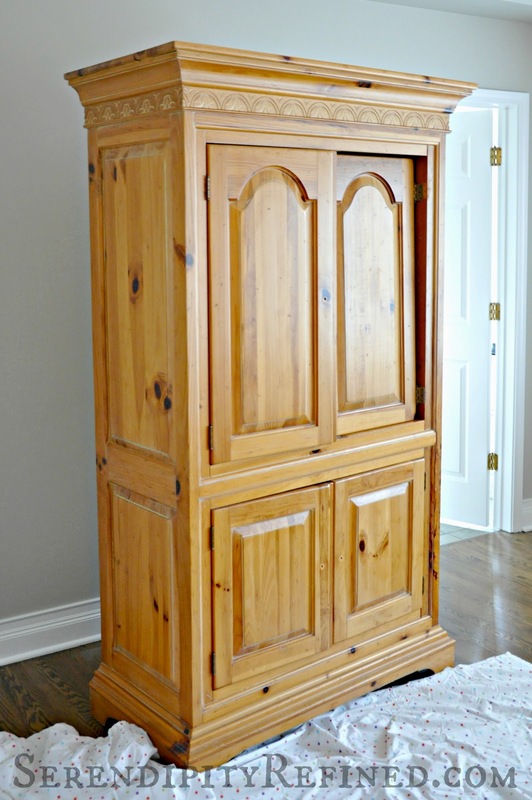 To tell you the truth, I wondered if someone would have an armoire to paint this year after Nancy's fabulous armoire which we transformed using ASCP Provence with dark wax, last year so I was really excited when Maureen messaged me about her pine cupboard. If you haven't seen Nancy's cabinet, you really should (click the link above to view the original post). 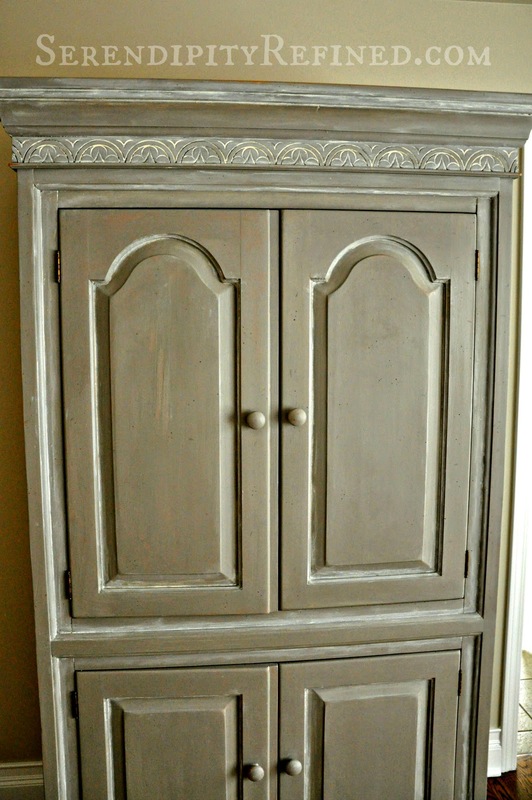 It's one of my most popular painted furniture projects with over 7,500 pins and shares to date! 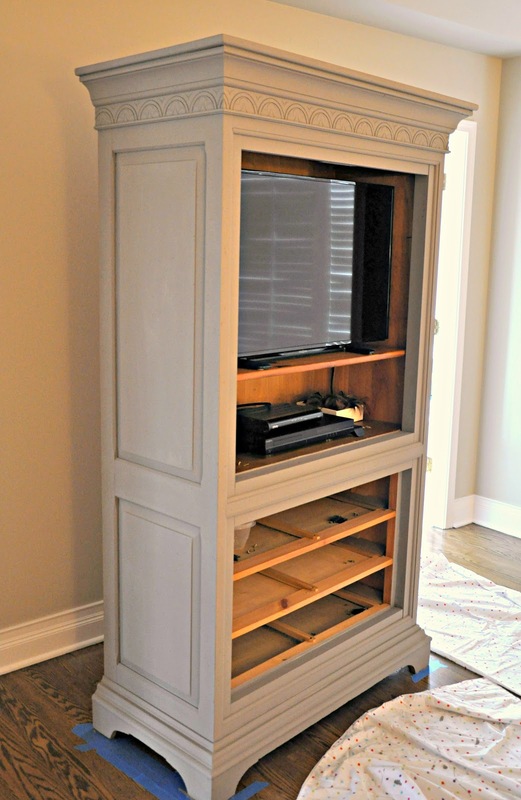 Maureen's armoire holds a television in her master bedroom. 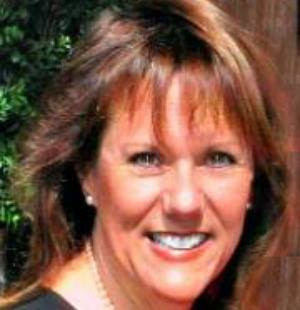 She has had this piece for over 25 years and was ready for a change. She's in the process of redecorating her bedroom to a more neutral palette with a more French feel and told me how excited she was to see my offer pop up on her screen last week because she was hesitant to paint such a large piece as her first project without someone to give her direction and to make sure that things went well. We began by removing the interior drawers, the doors and all of the hardware from the cabinet. Since we weren't painting the interior, we simply pushed the television and receiver away from the front face frame of the cabinet and were extra careful when painting the front edge. *NOTE: This is the only previously finished piece that I have painted without sanding first. If there had been any question in my mind about the finish, I would have sanded prior to painting using a fine or medium grit sanding block. 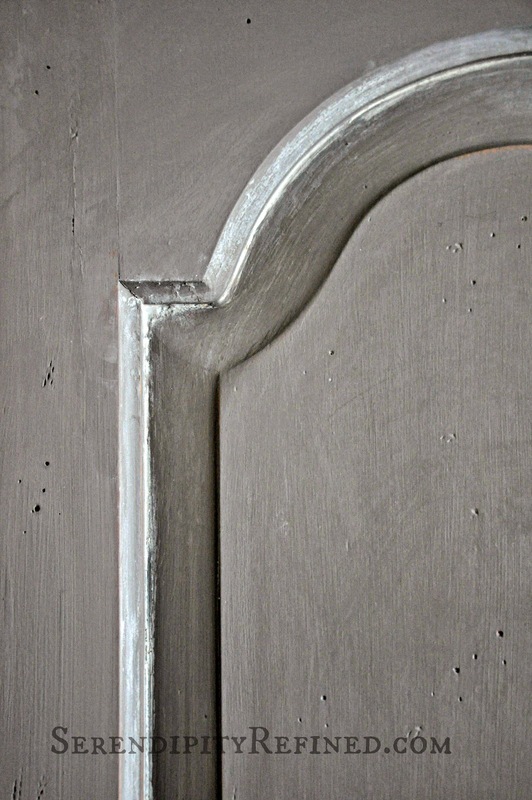 We painted outside of the piece using two coats of Annie Sloan Chalk Paint in French Linen and allowed it to dry. We sanded and very lightly dry distressed using a fine grit sanding sponge. To make the white wax, I scooped about four tablespoons of clear wax into a small bowl then added two to three tablespoons of Old White Chalk Paint and mixed well. Making colored wax using clear wax and chalk paint is a tip that I learned from Annie Sloan very early in my experience with the brand. 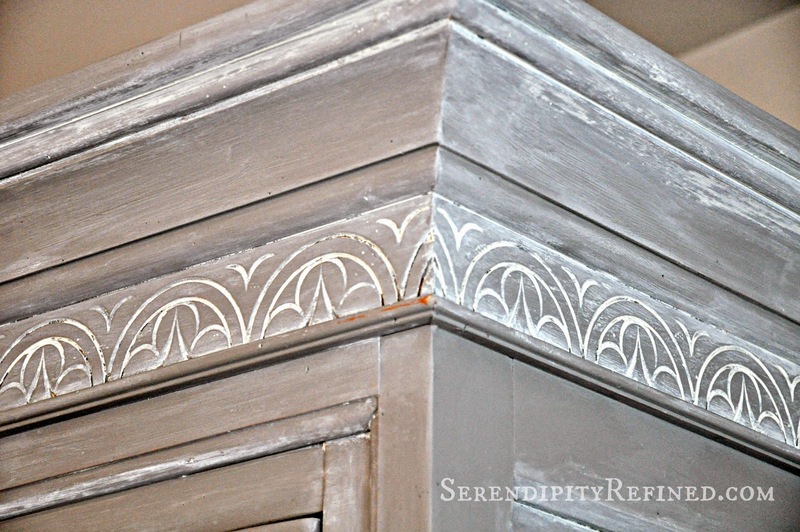 Please note that it's essential to use Chalk Paint to make colored wax. Latex paint does not work for this process. Also, if you make your own colored wax, be aware that wax with paint in it dries more quickly than plain wax or dark wax so you'll need to work more quickly to apply it and wipe it back while it's still damp. We finished the remainder of the piece with clear wax. 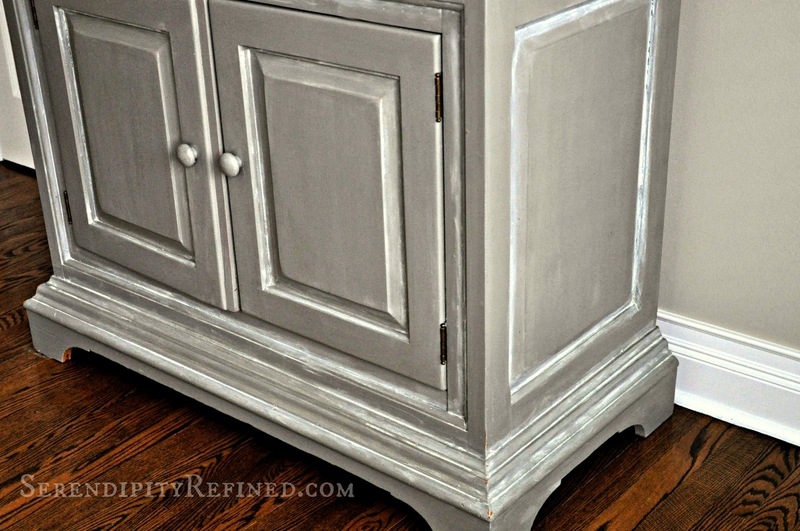 This same look can be achieved by painting the piece with French linen, clear waxing the entire piece and then brushing Old White chalk paint into the creases and wiping it off with a slightly rough damp cloth, like a piece of terry cloth, while the Old White paint is still damp. This process is known as "wet distressing". Finish by waxing the entire piece with clear wax. 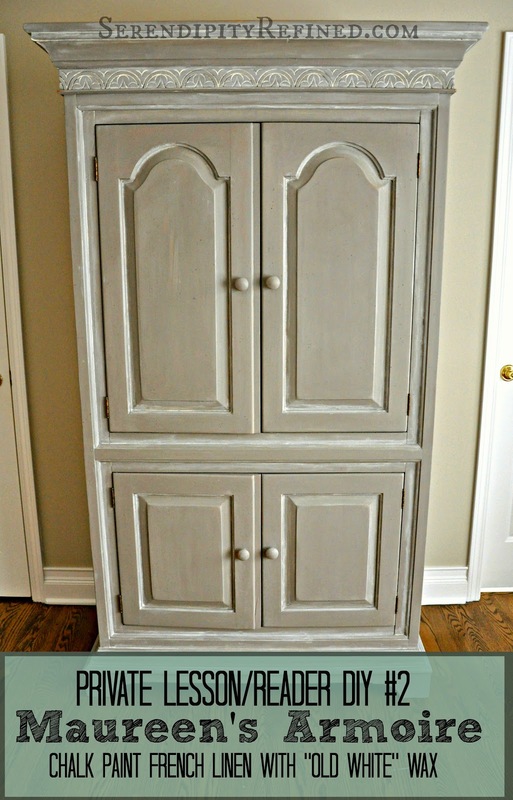 Maureen and I completed the transformation of her pine armoire from frankly forgotten to fabulously French in about four hours using just under one quart of Annie Sloan Chalk Paint in French Linen paint and just a few tablespoons of Old White. Like many of the people that I've taught to paint furniture over the years, once she got started, Maureen was surprised at how easy it is to make over furniture using Chalk Paint and she was really excited about how well her first piece turned out but there was never any doubt in my mind that her first piece would be perfect! 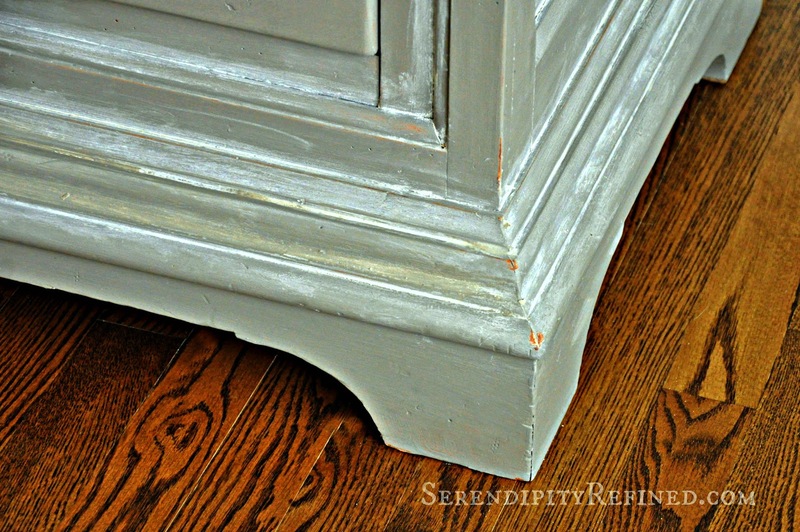 As I said to her while we were cleaning up: "The nice thing about painting furniture using today's decorative furniture paint is that even if something goes wrong, it's nothing that a little sand paper, a damp cloth, and more paint won't fix!" With one successful project behind her, she's already planning a makeover for her two nightstands and I can't wait to see how they turn out! Thanks so much for reading. I hope that you'll stop by tomorrow for a quick and cute Easter project. If you'd like to see the first piece in this year's series, Elaine's French Table makeover, click here.